“Climate Refugees” (2010), at the DC Environmental Film Festival and also with iTunes, written and directed by Michael P. Nash, explores the potential global consequences of the mass homelessness that is likely to develop from global warming, most of all in low-lying areas. The film starts out by looking at island countries like Maldives and Tuvalu, before focusing on Bangladesh, and the capital Dhaka. The film does talk about population growth in poor countries, but it doesn’t give as much hope for more use of open land (as did “Population Bomb”, yesterday). It proposes that some countries will try to negotiate to get sovereign control over new land, to move their people. It also proposes the radical idea that richer countries, based on their carbon emissions, could be required to house people displaced from poor low-lying (or drought-stricken) countries, to the point that individual citizens are expected to get involved with this “radical hospitality”. It also mentions the fact that people can seek political asylum today, but there is as yet no procedure to apply for asylum based on environmental destruction of homeland. And even with political asylum, the administration doesn’t like to discuss what it could demand of ordinary citizens to be sustained. The film also explores the displacement of people even within the US, especially from areas like Florida, which could lose 40% of its land. It mentions the displacement of almost a million people by Hurricane Katrina in 2005 as a precedent. Loss of mountain glaciers will deplete rivers, most of all in SE Asia, home of 3 billion people. The film makes the point that "desperate people" are easily manipulated by "bad people". It showed scenes of 9/11, and then of Occupy protests to make that point. Toward the end, the film takes on a more personal character, saying that expectations of a high standard of living lead people to demand more than the planet can afford. Hence, it’s not so much population alone as “economic growth”. But the film is quite optimistic that solar and wind energy can reduce carbon emissions and help maintain living standards. The main site for the film is here (Netflix Red Envelope). The film may have been slightly edited with more footage recently. 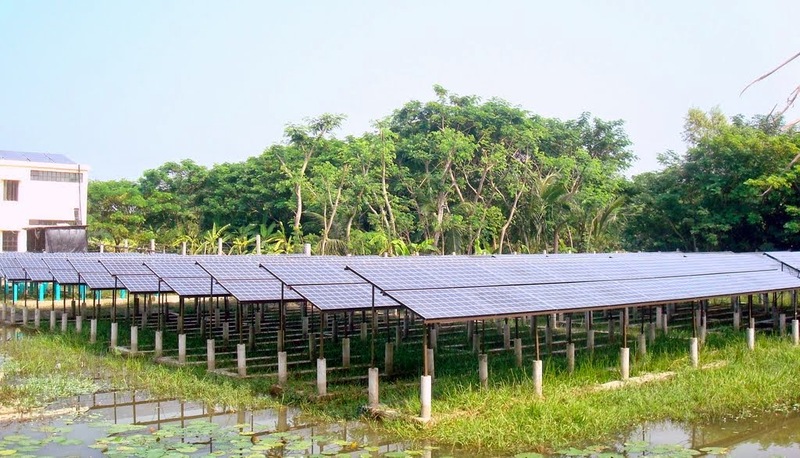 Wikipedia attribution link for photo by Ahsanul Hoque under Creative Commons Share Alike 3.0 license, of off-grid solar panels in Bangladesh, an irony.